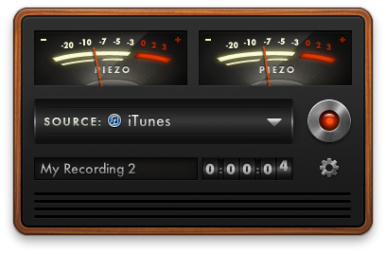 If you find recording audio from one of your Mac’s apps just too darn cumbersome, the audio experts at Rogue Amoeba have just the program for you. The company’s newest app is Piezo, a lightweight and easy to use audio recorder. Piezo is designed for users who want to quickly and simply record some audio, whether it be from a microphone or from one of your Mac’s apps. (For example, say you want to record a Skype conversation, or something that’s playing in your Web browser.) Just select the source from the drop-down menu, pick your recording quality, and hit the big red button. Piezo’s realistic VU meters will light up and start bouncing to the rhythm as the seconds tick by. When you’re done, stop recording and click the magnifying glass that appears to reveal your file in the Finder. If nothing else, the application’s interface is gorgeous, evoking an actual recording console without slavishly adhering to skeuomorphic ideals. Piezo supports capturing audio in 256-kbps and 128-kbps VBR stereo MP3, as well as 256-kbps, 128-kbps, and 64-kbps stereo AAC. Keep in mind that before Piezo can record audio from any currently running app, it’ll have to quit and relaunch that program. Rogue Amoeba’s more powerful (and pricier) Audio Hijack Pro sports an Instant On feature that can circumvent this requirement. Rogue Amoeba is, of course, the purveyor of many fine audio-related apps, including Airfoil, Fission, and the aforementioned Audio Hijack Pro. Piezo requires Mac OS X 10.6 or later; you can pick it up for $10 and from either Rogue Amoeba’s site or the Mac App Store. A free trial lets you record up to 10 minutes of audio per launch.